Triclosan (TCS) is a potential endocrine-disrupting compound (EDC), which produces an adverse impact on aquatic life and human beings. Wastewater discharge is considered as the primary source of triclosan in water bodies. The study is aimed to investigate the occurrence and environmental risk of triclosan released by municipal wastewater treatment plants (WWTP). An analytical protocol was developed and validated to determine the presence of TCS in the samples through offline solid-phase extraction (SPE) and liquid chromatography - electron spray ionization (ESI)—quadrupole mass spectrum (LC/ESI/MS). The limit of detection and quantification of protocol was estimated as 2.8 ng/L and 6.25 ng/L, respectively. The season-wise influent and effluent samples from two WWTP in Chennai, India, were monitored. The TCS concentrations in samples were found in the range of 443 to 1757 ng/L. 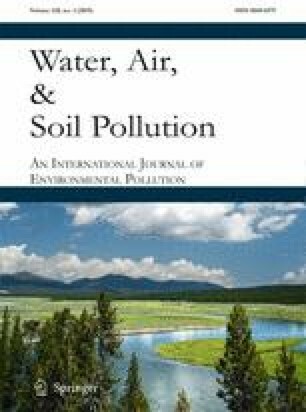 The Risk Quotient (RQ) method was performed to evaluate the environmental (ecotoxicological and human health) risk associated with the exposure of TCS-containing wastewater. The results of the study revealed that primary producer (algae) was highly vulnerable to exposure of TCS in the aquatic environment. The estimated daily intake of TCS was much lower than the reference dosage, and this indicates that TCS did not produce any considerable risk to human health. Also, it suggested that additional treatment was required for complete removal of triclosan residues. Central Intelligence Agency (CIA). The world fact book https://www.cia.gov/library/publications/the-world-factbook/rankorder/2102rank.html Accessed on 2 May 2018. European Union Commission implementing decision (EU) 2016/110: Not approving triclosan as an existing active substance for use in biocidal products for product type1. https://eur-lex.europa.eu/legal-content/EN/TXT/?uri=CELEX:32016D0110. Accessed on 10 March 2018. Salim S (2016) Fish consumption pattern in India, exports - overview http://eprints.cmfri.org.in/10991/1/Food%20and%20Beverage%20News_Shyam%20Salim%202016.pdf. Assessed on 10 March 2018. United State Environmental Protection Agency (USEPA). 2008. Reregistration Eligibility Decision for Triclosan List B Case No. 2340. United States Environmental Protection Agency, Office of Prevention, Pesticides, and Toxic Substances. September. EPA 739-RO-8009. https://archive.epa.gov/pesticides/reregistration/web/pdf/2340red.pdf. Accessed on 10 March 2018. United State Food and Drug Administration (USFDA) (2016). FDA issues final rule of safety and effectiveness on antibacterial soaps. https://www.fda.gov/newsevents/newsroom/pressannouncements/ucm517478.htm. Accessed on 10 March 2018. World Health Organization (WHO. (2002). Global assessment of the state-of-the-science of endocrine disruptors. International Program on Chemical Safety. http://www.who.int/ipcs/publications/new_issues/endocrine_disruptors/en/. Accessed on 10 March 2018.